These two images show the different views of comet Tempel 1 seen by NASA's Deep Impact spacecraft (left) and NASA's Stardust spacecraft (right). Two craters, about 300 meters (1,000 feet) in diameter, help scientists locate the area hit by the impactor released by Deep Impact in July 2005. The dashed lines correlate the features. An artificial crater on the comet Tempel 1 created nearly six years ago by a NASA spacecraft takes center stage in a flood of new photos released late Tuesday (Feb. 15) after another probe revisited the comet. The intentional scar on comet Tempel 1 was created in 2005 by NASA's Deep Impact mission, which dropped a small probe on the comet to see what it was made of. 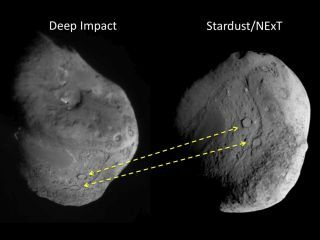 The space agency's Stardust spacecraft flew by Tempel 1 late Monday (Feb. 14), snapping close up photos that provide a new look at the battered comet, including the Deep Impact crater. "We see a crater with a small mound in the center, and it appears that some of the ejecta went up and came right back down," said Pete Schultz of Brown University, Providence, R.I., in a statement. "This tells us this cometary nucleus is fragile and weak based on how subdued the crater is we see today." It also means that Tempel 1's man-made crater partially healed itself as the ejecta settled and refilled part of the depression. The 72 high-resolution photos of comet Tempel 1 snapped by Stardust clearly show the crater created during the Deep Impact collision. The crater is 492 feet (150 meters) across and is tucked between two larger craters that predate the Deep Impact mission. This pair of images shows the area affected by the impactor released by NASA's Deep Impact spacecraft in July 2005. On the left, the image from Deep Impact shows a dark mound about 50 meters (160 feet) in size. The image on the right, newly obtained by NASA's Stardust spacecraft Feb. 14, 2011, shows the impactor erased that dark mound and flattened the area. Comet Tempel 1 is 3.7 miles (6 km) wide and completes one trip around the sun every 5 1/2 years. In July 2005, the Deep Impact mission smacked it with an 800-pound (363-kilogram) copper probe while its mothership watched from a safe distance. The Stardust probe's main mission was to observe how Tempel 1 has changed since that crash. The Stardust spacecraft flew within 110 miles (178 kilometers) of comet Tempel 1 when it zipped by the icy wanderer Monday night at about 11:40 p.m. EST (0440 Feb. 15 GMT). And the Stardust probe did not disappoint. Not only did it snap photos of the Deep Impact crater, but also collected information on the atmosphere around Tempel 1. Stardust recorded data on the amount of dust cloud, called the coma, around comet Tempel 1. It beamed back 468 kilobytes of data and apparently took a beating as it zoomed past Tempel 1 at 24,300 mph (39,107 kph). The spacecraft passed through waves of comet particles as it flew through the cloud around Tempel 1. At least 12 hits penetrated through more than one layer of the Stardust spacecraft's protective shielding, NASA officials said. "The data indicate Stardust went through something similar to a B-17 bomber flying through flak in World War II," said Stardust-NExT co-investigator Don Brownlee of the University of Washington in Seattle. "Instead of having a little stream of uniform particles coming out, they apparently came out in chunks and crumbled." This image shows comet Tempel 1 and the location of an artificial crater created by the Deep Impact mission in 2005. Stardust's comet Tempel 1 flyby went flawlessly save for one hitch. When the spacecraft turned its antenna back to Earth to beam its photos to eager scientists and space fans, it sent them in chronological order instead of relaying the closest, most eye-catching views first. Because Stardust takes a while to send each photo across the 209 million miles (336 million km) between comet Tempel 1 and Earth (it takes light about 19 minutes to make a one-way trip) it meant a long wait to see the comet flyby highlights. The first new photos of comet Tempel 1 relayed by Stardust were from more than 1,000 miles away, NASA said. But despite the delay, NASA scientists said they are excited to begin diving into the wealth of data returned by the Stardust probe. It was the second comet flyby for Stardust, which visited the comet Wild 2 in 2004. NASA called its extra trip to Tempel 1 "Stardust-NExT, for "New Exploration of Tempel." "This mission is 100 percent successful," said Joe Veverka, Stardust-NExT principal investigator of Cornell University, Ithaca, N.Y. "We saw a lot of new things that we didn't expect, and we'll be working hard to figure out what Tempel 1 is trying to tell us."